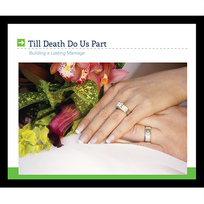 These messages focus on the topic of commitment in marriage, illustrating what faithfulness and integrity mean in the relationship. Because we are so easily deceived when it comes to matters of romance and marriage, Pastor Lutzer also warns us about the danger of being misled by our emotions rather than maintaining our commitment to our spouses and to God. In a world where divorce is common, these scriptural truths are intended to bring back to the reality of what God intended marriage to be.